José Mourinho is now well known for his anti-football approach, and his mentality that if you don’t have the ball, you can’t make mistakes. Manchester United haven’t exactly been successful so far this season, sitting 7th in the table after winning only 6 of their opening 13 games. United have come under scrutiny for their defensive, lacklustre performances. Despite always being a pragmatist, Mourinho was not always this negative. During his time in Portugal, Mourinho’s Porto side broke the points tally in 2002-03 season, winning plaudits for their attractive attacking play. The next year, they won the Champions League, beating Manchester United along the way. The Special One announced himself in English football the following season, moving to Chelsea in 2004. He was an instant success. Chelsea beat Manchester United and The Invincibles to the league title, securing a new record points tally in the process. He won the league again the following season, but failed to keep this run going and was pipped to the title by Manchester United in 2007, his first season without a League Title in 5 years. He did however win the FA and League cups. Following a poor start to the 2008/09 season, Mourhinho left Chelsea by mutual consent. It was during this time that he was approached by Barcelona to become their new head coach. Mourinho was snubbed, Barca opted instead for the inexperienced Pep Guardiola. The rest is history. Mourinho won the Scudetto in his first season, with the most goals, most wins and least goals conceded. However it would be the 2009/10 season which would bring Mourinho his biggest success. Mourinho became the first manager to reach the semi-final stage of the Champions League with three different teams. His opponent was the side who had snubbed him a year earlier. Inter beat Barca 3-2 over the two legs, despite losing the second leg 1-0 at the Camp Nou. Mourinho celebrated as if he had won the competition right there. He knew he had. Inter beat Bayern 2-0 in the Final to secure a treble, the first Italian club to do so. It would be Mourinho’s last game at Inter, he moved to Real for the following season where he would spend three years being second best to Pep Guardiola. In some ways I think it’s been all downhill since then for José. He seems to have lost that enigmatic touch that made the media here fall in love with him. Now he is just miserable and sour, as if he has fallen out of love with the game. But I digress. We are here to talk pragmatism, tactics and the art of winning 1-0. Back in 2010, José Mourinho was the king. Pragmatism is defined as an approach which assigns value based on the success of a theory or belief. In a footballing sense, it doesn’t matter the style of football, only what gets results. Often described as Machiavellian, Mourinho has always been a follower of this style. José Mourinho generally lined up with a 4-2-3-1 at Inter, sitting deep and compact without the ball, then launching into fast and fluid counter attacks when winning the ball back. Maicon would use his pace and power to drive forward and Eto’o would drift more centrally, to allow space for the overlap. The remaining defenders would move right to cover, Stankovic would drive forward and Pandev would stay wide to provide width on the left. This allows the team to be solid in their defensive shape, whilst creating overloads in certain areas when attacking. Sneijder would often drop deep, to draw out opposition defenders, then find a killer pass through the lines to one of the advancing midfielders or strikers. Mourinho also knew when to adapt his tactics. He made two changes to this line up for Inter’s Semi-Final second leg in Barcelona, bringing in Christian Chivu to replace Pandev and Thiago Motta to replace Stankovic. These changes were both defensive ones, and Inter lined up in a 4-4-1-1 rather than a 4-2-3-1. Thiago Motta was sent off in the 28th minute, a straight red for brushing his hand against Sergio Busquets’ face. Again Mourinho had to adapt, asking his team to drop to a 4-4-1. Inter battled hard, dug deep and defended their aggregate lead. It was enough to stifle Barca. Pique scored the only goal of the game and Inter had done it, the 1-0 scoreline enough to see them through. It is this pragmatic approach I am trying to replicate in my Trapani save. Below I’ll outline my tactic, and analyse how well it has done over the course of my first season in charge. Starting out the tactic I opted for a fluid counter attack as a starting point. We start with a 4-2-3-1. Here are the player roles. Immediately you will spot that I have flipped the tactic laterally. I did this based on the players I had available, rather than for any tactical reason. Starting from the back, the GK and two CDs are fairly straight forward, we want tough, no nonsense defenders who can hold their own in the air and be strong in the tackle. If you feel more comfortable you could use NCBs. One of our Full Backs is a WB-Su. I found that WB-At was too attacking, and the player would often neglect his defensive duties. The other FB needs to hold his position so a FB-De or NFB-De works well here. The DLP-De is our Cambiasso, covering the midfield and dictating the play, distributing quickly to our AP. Alongside him is our Stankovic, a CM-At. He is tasked with running the midfield and getting forward. I’ll often change his role to CM-Su or BBM-Su if we’re playing tougher opposition. Looking at the front four we have a W-Su on the right to provide width and an IF-Su on the right to cut inside and allow our WB to overlap. Our AP-Su is tasked with dropping deep and finding passes into the wingers and striker. The PF-At is our leader from the front. We need him to be tall, strong and athletic, think Drogba at Chelsea or Milito at Inter. I often find myself adapting my tactics based on the opposition. If I see a weakness we can exploit, I’ll adapt my tactics based on this. For example if the opposition plays a narrow formation such as a 4-3-2-1, I will ask my players to exploit the flanks and play wider. If we’re playing a particularly tough team, I may decide to play a 4-4-1-1, dropping the AML/R back to ML/R. It’s this adaptability that makes this tactic so potent, exploiting your opponents weaknesses is the key to victory with this approach. A lot of it depends on your personnel. For example I use low crosses as my team are relatively small. However there are some instructions that are key to making this tactic work. Other good additions would be Whipped/Low Crosses, Run At Defence, Pass Into Space, and Distribute to Target Man, however these aren’t necessary. Again it comes back to your personnel and preferences. As for PI the main ones are to have your wide players (DR, DL, AMR, AML) Sit Narrow/Wide dependant on your lateral variant. I also have my AP Hold up the Ball in an attempt to drag central defenders away from the back four. Here’s our counter attack in action. Nzola holds the ball up really well and is there to smash it home from 4 yards out. We finished second, being outdone by Juve Stabia, who were the better pragmatists with eleven 1-0 wins. However, we did only concede 18 goals, and we kept 21 clean sheets, the most in the league. With a predicted finish of mid table, I was quite pleased, although this did mean we would have to gain promotion through the playoffs. 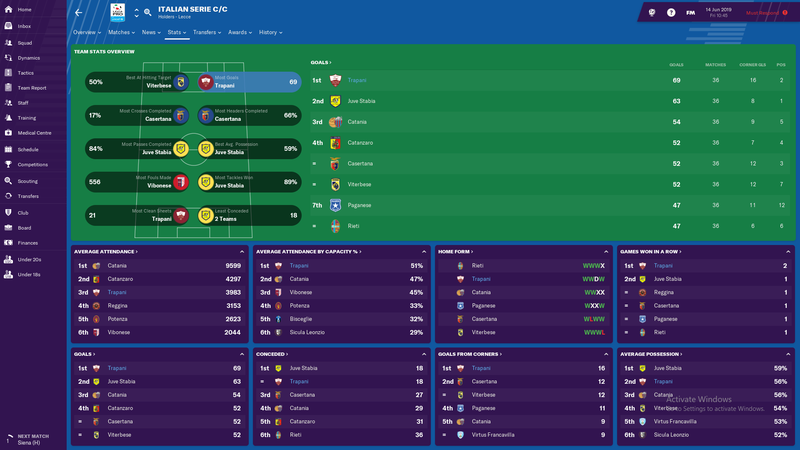 We applied our pragmatic approach where it mattered, winning the Playoffs to gain promotion to Serie B, conceding just one goal. Overall, I was really impressed with how the tactic worked out. We kept lots of clean sheets and scored plenty of goals. It seems that even 8 years later, Mourinho’s tactics can still work to good effect. Pragmatism still has a place in football, even if the Special One has lost his touch. Thanks for reading and I hope you enjoyed my piece. If you’re interested in the background to my save you can check it out here. Who will win the Nations League? Is there a download for the tactic? Not currently, but the instructions and player roles are there. I generally play on a Cautious or Standard mentality depending on the opponent. What’s your team mentality in this tactic? This is good work, I too made a tactic inspired by his time at Inter, albeit, It wasn’t setup to primarily counter attack, I basically reapplied some of the principles (which I thought were brilliant btw) such as the narrow sitting inside forward (attack duty) Complemented by the overlapping wingback, then the double pivot of two sitting midfielders (DLPs-CMd). It was a really productive tactic.